Mustard is not just for hot dogs. This a great recipe for our Gourmet Pretzels. Add this to your favorite smoked-cured meats and consider it a home-run. Balanced earthy flavor with a touch of sweetness plus caramelized onions and peppers. 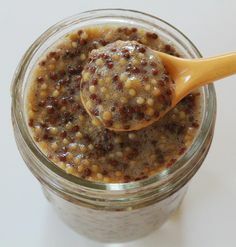 In a stainless-steel bowl, combine the black and yellow mustard seeds with 1 cup of the malt vinegar and 1/2 Guinness. Cover the bowl with plastic wrap and refrigerate overnight. Combine the remaining 1/2 cup vinegar, the remaining 1 1/2 cups beer, the dry mustard powder, flour, honey, sugar, salt, black pepper, turmeric, cayenne, and cloves in a small saucepan and bring to a simmer over low heat. Add the soaked mustard seeds and their liquid and simmer for an additional 5 minutes, stirring constantly. Transfer the contents to a blender and pulse two or three times just to fully combine, but do not puree. You want most of the mustard seeds whole. Transfer to clean glass or plastic containers, seal well and refrigerate for up to 1 year.